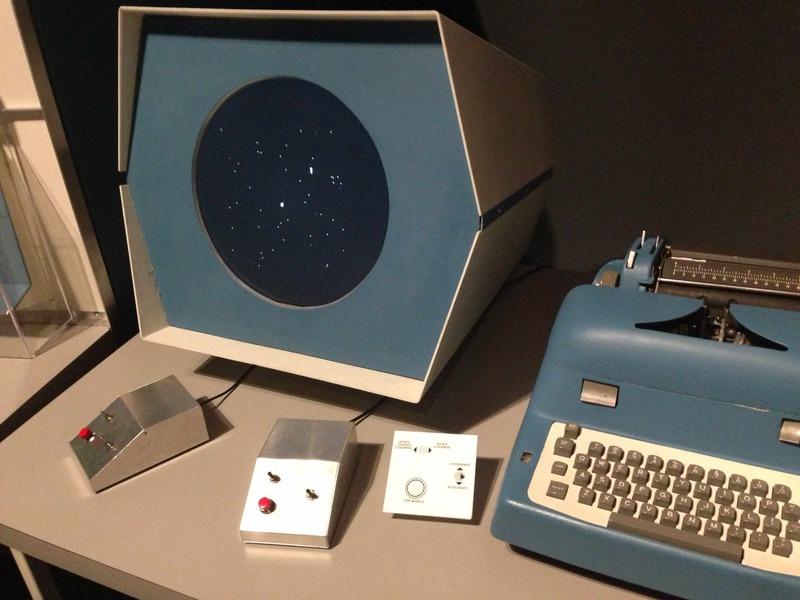 Replica of the round CRT and game controllers developed at MIT in 1962 to run Spacewar on DEC’s PDP-1, the first commercial interactive computer. Note input-output typewriter. It’s all aliens, flying saucers, galaxies, and other worlds inside the Museum of the Moving Image’s tribute to gaming history, Spacewar! Video Games Blast Off, soon ending in Queens. The big, expansive dark gallery is a gamer’s dream, with flashing lights, arcade consoles, virtual headgear, and wall-sized projections distributed around the room. 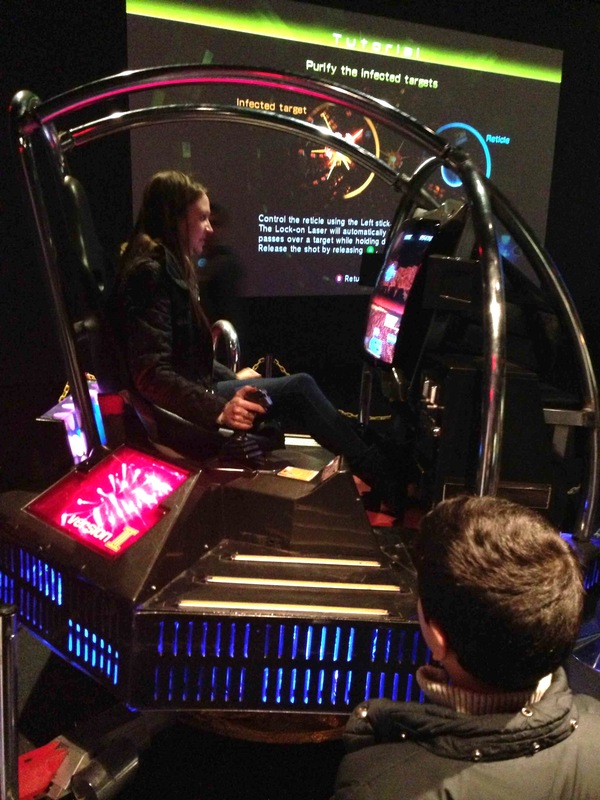 Last weekend, enthusiastic museum-goers were happily roaming through the space, enjoying the please-touch experience of interacting with 20 historic video games from the last 50 years. Yes, they all work! The show begins with a reverential replica of the game that started it all in 1962 at MIT, Spacewar, the first virtual intergalactic battle in deep space. Check out the story of SpaceWar, a slick, fun video created by the Computer History Museum in Silicon Valley. (Spoiler alert: it involves model railroading.) If you want to read more, here are links to the 1972 Rolling Stone article that predicted that computer gaming was going to take off in big ways. Child waits turn as museum-goer enjoys Galaxy Force II, Sega’s 1988 arcade game built upon a flight-simulator cabinet. The museum did not feel compelled to arrange its time-machine arcade in chronological fashion, and it’s fun switching back and forth among the different technologies. You’ll find Atari’s 1979 Asteroids arcade unit is next to Nintendo’s 2009 Super Mario Galaxy II and Atari’s 1982 home console for Yar’s Revenge. There’s even the 2009 iPad game Osmos. No one has to wait very long to step up and play, although there was tiny queue for Space Invaders, the 1972 arcade sensation that was one of the earliest microprocessor-based units. Dads were having fun explaining to kids exactly why it didn’t fire as fast as games they have at home. Leave that light saber app holstered, and get to Astoria to relive what it was like the first time you fought in space. Note: Admission gets each person four complimentary arcade tokens, but you can always buy more. This entry was posted in History, Museums, Technology and tagged arts, culture, design, history, museums, science by mssusanb. Bookmark the permalink.